In between parent-teacher conferences today, I made a new Curriculet for Act 1, Scenes 3 & 4 of Macbeth. If you’re planning to teach Macbeth in the imminent future, you can check it out here. 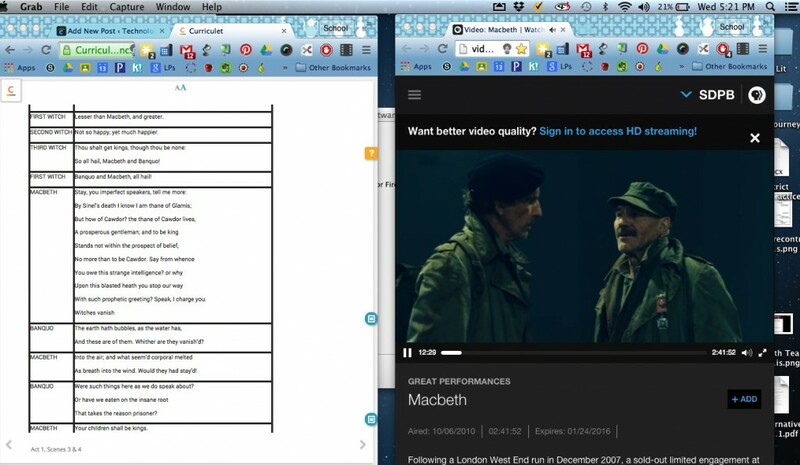 The great thing about Curriculet is I can embed video links that allow students to view the scene before they read it. Or, if they resize windows, they can watch it side by side with the text. This allows for 1) students to pick up on body language and non-verbal cues and better understand the text, and 2) consider the lines that aren’t included or are rearranged in the film and why the director made these choices. Below, you can see the side-by-side windows that I encourage my students to use when they’re “reading” Macbeth. This method is a great way to “flip” our classroom, especially when I have several student-athletes who plan to be gone. Next week, we tackle Lady Macbeth’s opening soliloquy in Scene 5–then I’ll be testing out the Socratic Smackdown. I’ll keep you posted with how it goes.